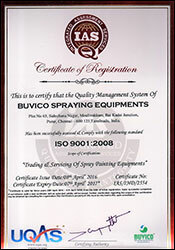 Bringing forth a precision designed range of High Pressure Washer, Electric Putty Mixer, Airless Paint Sprayer & Hand Pallet Trucks, Contractor Products, Cement Plastering Machine, Spray Machines, Heavy Coat Pump Series, Dry Wall Sanders, Putty Sprayer, Cleaning Accessories, Drywall Sander etc. In an attempt to provide our customers with products that adhere to international quality at industry leading prices, we have appointed a team of qualified quality personnel, who possess immense knowledge and experience in their respective domain. They work round the clock to ensure that our customers get their value for money and we succeed in our mission of 100% customer satisfaction.